Cover of the 1998 Fourth Estate edition. The story was first published in The New Yorker in 1997. When my husband was four, he asked for a clock. Any kind, really. As long he was going to be allowed to pull it into tiny little pieces. Over time, he moved on to old TVs, broken video recorders, radios, cars. Eventually he learned to put things back together—and at some point, he even found there were no pieces left over. Meanwhile, I spent years with my nose pasted between the pages of a book. I’d read one, then read it again. I was a very happy consumer of those imaginary worlds. It didn’t occur to me to unscrew the back, and see what made it all tick. So I thought I’d come late to the take-it-apart party, and have a closer look at some stories I admire. First, I had a look at Margo Lanagan’s Sea Hearts (which is a gorgeous book about selkies, love and beauty). 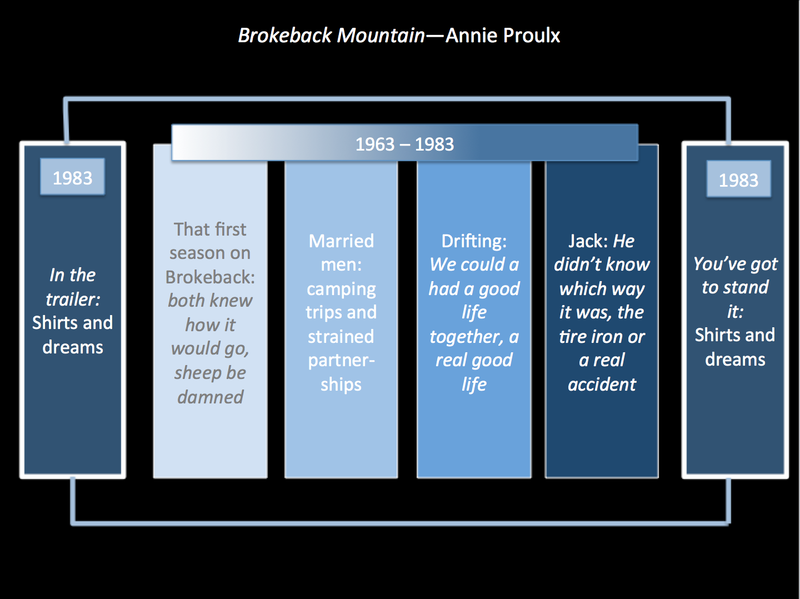 This month, I’ve been thinking about Brokeback Mountain, by Annie Proulx. Like a lot of people, I’d seen the film. But I hadn’t read the book—nor had I realised that it was actually a short story, coming in at 58 small-format pages of pitch-perfect prose. 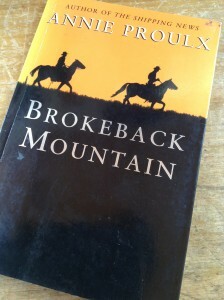 Now I’m sure there are lots of ways of thinking about Brokeback Mountain, but I’m going to focus on it as a love story—because in essence, that’s what it is. The relationship between Proulx’s two characters, Ennis and Jack, isn’t an easy one, but we believe it; it’s real love. And given how tough that can be to recognise in real life, bringing it not just convincingly—but beautifully, and honestly—to life on the page is a pretty neat trick. So in taking a look inside this particular clock, I want to know: How does Proulx bring love between two pretend people into the real world, and make it matter? In trying to answer this question, the first thing I did was make myself a little diagram. (Warning: there are no big spoilers here, but there are plot points—so if you don’t know the story and you’re the kind of person who likes to be surprised … well, you’ve been warned). Now this is just a very simple outline showing how I see the story’s structure (I certainly wouldn’t set your watch by it). The first thing I noticed was the ‘frame’ that Proulx has put around the story—represented here by the two dark blue rectangles on the far left and right. Both of these sections are set at the same time, and they use two key motifs: Ennis dreaming about Jack, and a pair of shirts hanging on a nail. The opening section gives us a glimpse of the shirts (they’re explained later on), and we only get hints about what’s in Ennis’s dream—but by the time we learn that he’s had it, we’re right there with him, at 5am on a windy morning, in a flimsy aluminium caravan. They were raised on small, poor ranches in opposite corners of the state, Jack Twist in Lightning Flat, up on the Montana border, Ennis del Mar from around Sage, near the Utah line, both high-school drop-out country boys with no prospects, brought up to hard work and privation, both rough-mannered, rough-spoken, inured to the stoic life. We know that these two somehow belong together; Ennis and Jack are a “they”. From here, the story follows the contour of a relationship which in its most basic sense (they meet, they fall in love, there are difficulties) is familiar. But Jack and Ennis’s difficulties are major: openly having a relationship would pose the real risk of violence, and even death. And this matters—it really does. But for us in the real world to care, first we have to believe in the ‘truth’ of these pretend people, and their love. During the day Ennis looked across a great gulf and sometimes saw Jack, a small dot moving across a high meadow, as an insect moves across a tablecloth; Jack, in his dark camp, saw Ennis as night fire, a red spark on the huge black mass of mountain. What this story does so well is hold two people simultaneously together, and apart. It does that structurally (through plot and so on) as well as with gorgeous words: from the description of Jack’s buckteeth as “not pronounced enough to let him each popcorn out of a jug, but noticeable”, to Ennis as “a little cave-chested … a small torso on long, caliper legs” and the way the two of them sat in front of the fire, “boot soles and copper jeans rivets hot”. Proulx takes an ordinary scene and makes it strange for us; gives us pause, makes us look again. In convincing us of the truth of her pretend people, Proulx performs a powerful act of empathy—not on herself (she’s already there), but on us. If we believe the truth of these two characters, and in their genuine connection, then their story really matters. It matters because it reminds us that there’s a whole world inside the head of every person we meet, and that there is often a wide gulf between what we think we know about someone, and the truth. Looking back, perhaps I didn’t try to ‘pull apart’ books when I was a kid because I didn’t want to spoil this kind of magic—the stuff that made a story matter. And there is a difference between reading with the clock back open, watching the gears turn, and looking at it from the front. But we can read both ways, right? And at least with a story, there’s no danger of finding stray words hiding under the toolbox when you’re done. I spent a lot of happy childhood days in an old plum tree, dreaming about stories. Nowadays I'm a bit nervous about the tree part, but I'm still reading, dreaming, and writing. Thanks for stopping by.